Seattle City Council Considers Legislation To Give Homeless Population Rights To Keep Camps As West Coast cities have seen a boom in homelessness, some have declared emergencies. But debates have broken out over how much tolerance should be shown to illegal camps in public spaces. 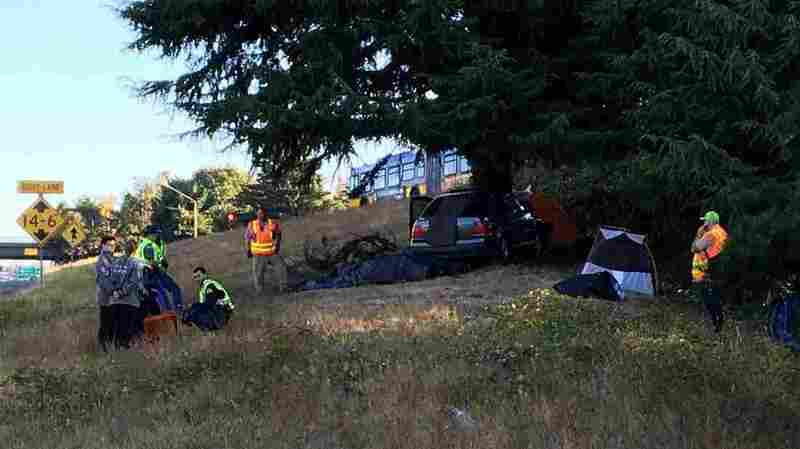 Officials inspect the scene at the Seattle homeless camp along Interstate 5 where a car ran off the road and resulted in the death of a young man who was in his tent. Earlier this month, that debate got a lot more urgent in Seattle, when a young homeless man who was camping along Interstate 5 was killed by a car that careened off the roadway. A couple of hours after the death, Seattle Mayor Ed Murray visited the site to view the wrecked tent and address what he calls the city's "homelessness crisis." "It is obvious that we cannot allow people to stay in places that are not safe for them," Murray said. The city has tried being more aggressive about clearing out illegal campsites, especially after five people were shot — and two of them killed — in a notorious camp called "the Jungle," back in January. But the city's "sweeps," as they were called, quickly ran into an angry backlash from homeless activists and civil rights groups. Now, the Seattle City Council is considering taking the opposite tack: passing legislation that would give homeless campers more rights to stay where they are, if the city can't offer them adequate permanent shelter. They'd even be entitled to city services such as garbage pickup. For some people, this takes tolerance too far. "Seattle, frankly, needs adult supervision," says Republican state Sen. Mark Miloscia, who is running for state auditor. Miloscia took a stance on the issue a day after the death along I-5 by calling a press conference in front of a small group of homeless people in a park near the Space Needle. "This is lawlessness! I believe it will attract tens of thousands of people to our state, and our jungles will get even worse," he says. 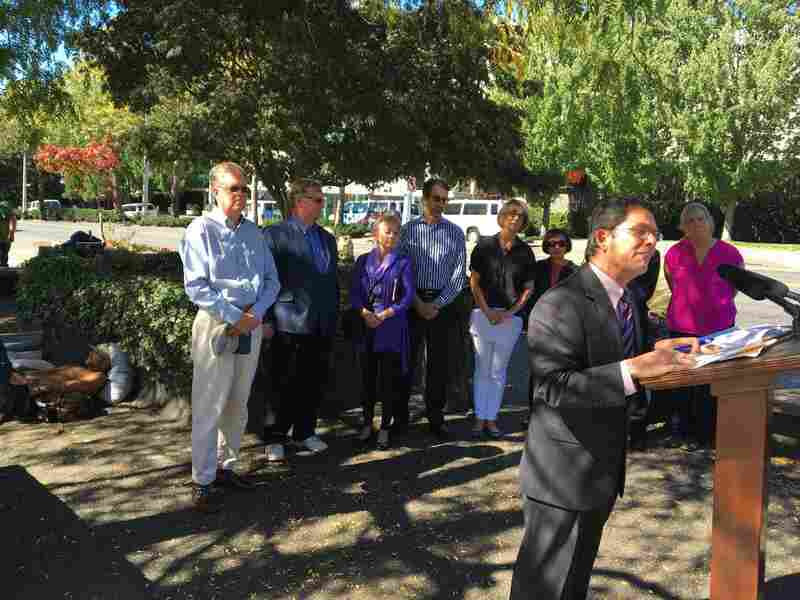 Republican state Sen. Mark Miloscia gives a press conference in front of a small group of homeless people. Miloscia says the homeless need more supervision. Homeless advocates say the argument over whether to tolerate the camps is a distraction. Barbara Poppe, a national expert in the field and former head of the Obama administration's anti-homelessness efforts, says cities won't have to decide whether to tolerate illegal camps if they do a better job of addressing the needs of the people in the tents. "The problem we have now is that there isn't a real option offered to folks to be anyplace other than where they are," Poppe says. Seattle hired Poppe to analyze the city's homelessness services, and in her report, she recommends deep changes. She says the city should redirect its spending to programs that can show real long-term success in placing people in stable housing. The report represents the new thinking in homelessness services, something called "Housing First," which prioritizes getting people into permanent housing and reducing barriers such as making sobriety a condition for shelter. This approach has been tried elsewhere, with success. But there's no guarantee improved services will make the camps disappear. "The people who really want to get off the street out here in Seattle, they can get off the street," says Tim Jackson, a homeless man who panhandles at the end of the I-5 exit ramp where the young homeless man was killed. Jackson is skeptical that better services would be that effective. "With the services that Seattle provides, Seattle got more services than all those other places that I've been to." At the same time, Jackson is glad the city now seems to be backing off on the sweeps. That's why he came here from neighboring Snohomish County — where he says the cops are quicker to crack down. As far as he is concerned, the camps should just be left alone. "Regular citizens don't really want the homeless people around them; well, most of us don't want to be around regular citizens," he says. "So we can have our own little city or neighborhood, and they can have their own neighborhood, and we can meet up at the grocery store or something." And those separate neighborhoods keep growing. Even on the green strip where the young man was killed last week, the tents are already back up. A previous photo caption misidentified the homeless camp as "the Jungle." The homeless camp where the young man was killed is in a different location along Interstate 5.